Seeing a wagon on the road today is unfortunately about as rare as seeing a Ferrari cruising Detroit in the winter. Okay, that is a bit of an exaggeration, but there is a palpable disdain for wagons in the U.S., which fell out of favor in the 1980s when minivans became the de facto family vehicle, only to eventually be usurped by crossovers and SUVs. But back in the 1950s and 60s, American families loved wagons. They were a staple in family road trips across the country. Now, these old wagons are relics of n bygone era. However, that doesn’t mean we can’t enjoy them, like his 1969 Chevrolet Chevelle Concours Wagon that’s for sale. The 1969 Chevrolet Chevelle Concours Wagon above isn’t for typical Thursday evening car show looker that’s trotted out a few times a summer. It’s heavily modified. Think of it as a high-powered grocery getter. Under the hood is a Chevrolet 350 small block V8 with the Twin TorqStorm Supercharger Kit providing forced induction. The mill cranks out 600 horsepower at the crank and 417 hp at the rear wheels. The engine pairs with a rebuilt 700R4 transmission capable of handling up to 800 hp. Other upgrades include a Holley Terminator EFI, Holley fuel pump and filters, MSD ignition, a 12-bolt rear end with Moser axels. 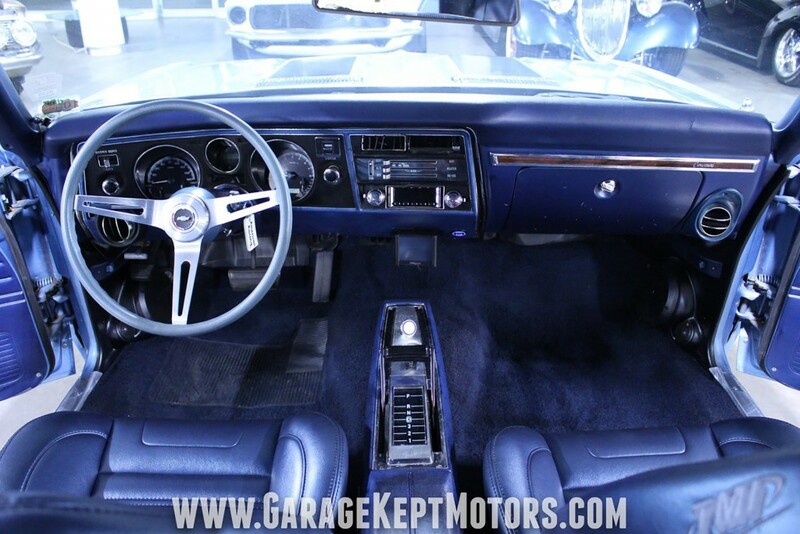 Inside, the Chevrolet Chevelle wagon sports Dakota Digital gauges, TMI bucket seats, and a Retrosound radio. Other upgrades include a Frostbite radiator, Old Air Products AC, Redline Lumtronix headlights, dual exhaust, and American Racing wheels. Only 3,700 miles have been added since the restoration. The exterior was repainted a few years ago in factory original Glacier Blue paint. Black, Yenko-style TorqStorm graphics were added. The ad on Motorious lists the asking price for the Chevrolet Chevelle at $42,900. However, the price sits below a bright orange “Make An Offer” button, if you’re so inclined to add it to your collection.